The Rocky Soil is the hearts that are filled with the spirit of pride, which has no mercy toward others; and the word of God does not combine to work in those hearts. The Thorny Soil is the hearts that submerged with life’s worries, the heart’s bitterness, the world’s pleasures and the world’s deceits. The Fruitful Soil is the pure heart, which the word of God deepens in it. 1. On the same day Jesus went out of the house and sat by the sea. 2. And great multitudes were gathered together to Him, so that He got into a boat and sat; and the whole multitude stood on the shore. 3. Then He spoke many things to them in parables, saying: “Behold, a sower went out to sow. 4. 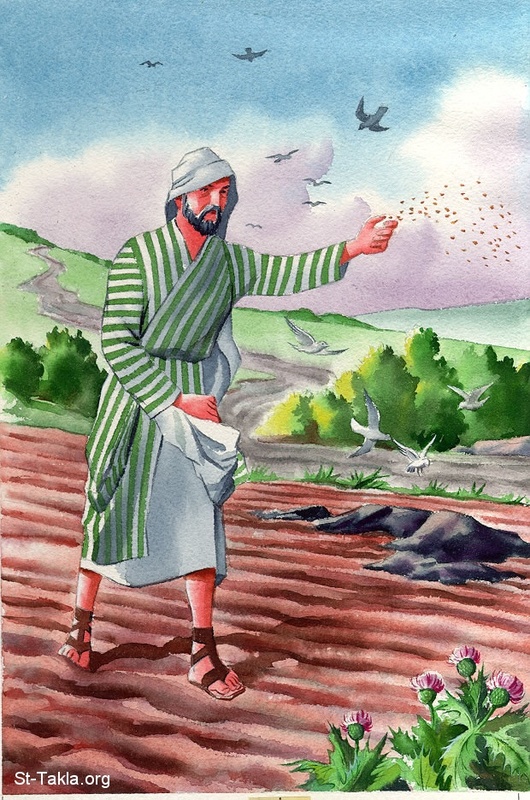 And as he sowed, some seed fell by the wayside; and the birds came and devoured them. 5. Some fell on stony places, where they did not have much earth; and they immediately sprang up because they had no depth of earth. 6. But when the sun was up they were scorched, and because they had no root they withered away. 7. And some fell among thorns, and the thorns sprang up and choked them. 8. But others fell on good ground and yielded a crop: some a hundredfold, some sixty, some thirty. 9. He who has ears to hear, let him hear!